The Lhasa Apso originated in Tibet where many common names among the breed can be traced. 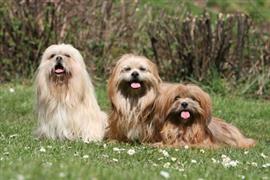 In fact, the breed’s name is taken from Lhasa which is the traditional capitol of Tibet. A few favorite Tibetan names include Palden (meaning glorious), Sonam (meaning gifted), Tashi (meaning good fortune), and Tinley (meaning enlightened activitiy). Tibet is known to have the highest average elevation of any region on earth. Some name ideas derived from mountains in the Himalayas include Lhotse, Makalu, Lakpa, Somoni, and Everest. The Lhasa Apso was originally kept by Buddhist monks to alert them of intruders entering the monastery. A few names borrowed from modern technological security systems are Siren, Viper, and Sonic. Some of our pages will contain a subcategory. A subcategory is a slightly more specific grouping than the main topic of the page. For a subcategory, we will include a separated table of names and corresponding descriptions. An example of a subcategory of Red Dog Names would be 'Dog Names Inspired by Red Wines'. If you have any subcategory ideas for the Lhasa Apso Names page, we would love to hear them. Use the form below to submit your ideas.